I mentioned that on August 8 I was waiting for the Rocky Mountaineer passenger train in Banff, Alberta. 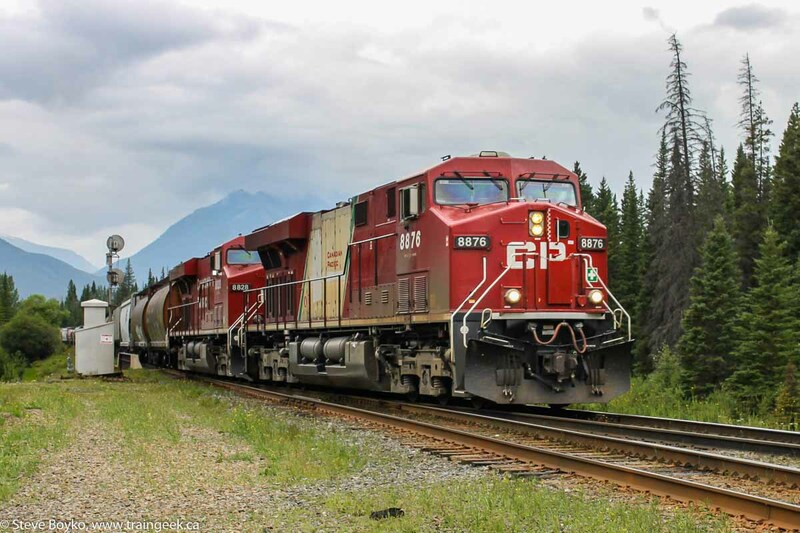 After watching three freights roll through, I finally heard them coming into Banff at 09:20. I shot them at Banff East. I raced down the Trans-Canada to shoot them at the station. I heard that a CP freight would pass them at Banff station and I wanted to ensure I crossed the tracks before the freight got there, or I would be skunked. I got there just in time, as the crossing lights came on about 15 seconds after I crossed the tracks. I parked and took my shots of the eastbound grain train. The train had CP 8876 and CP 8828. 8876 was one of the CP units painted for the Olympics, but the logo has been crudely painted over. I turned my attention back to the Rocky Mountaineer. I saw that GP40-2LW 8013 was "the Pride of Quesnel". After the grain train left, the Rocky Mountaineer's crew boarded the engine and rolled west. I shot each car, then hopped into my van and headed west as well. My intent was to shoot them at the place I had reconnoitered earlier that morning. I zoomed down highway 1, then took the 1A almost to the picnic area known as "Muleshoe". There was a little parking lot off to the left, occupied by a car and some Japanese tourists. I screeched to a halt, jumped out, and sprinted into the bush with camera in hand. I'm sure I made quite a sight. I scrambled down the rocks, hearing the Rocky Mountaineer's rumble close by. I got to about where I wanted to be when the train burst into view. A few clicks and it was gone... but I had the shot I wanted. Satisfied, I headed back to my van at a much more sedate pace. One of the tourists gave me a smile, and I headed back to my camp site.